I learned to drive in a Peugeot 404, built in the 1970s with a medium sized motor that hummed and was easy on the fuel. I remember my father telling me that this was his last car he’d ever have, so not to crash it! The 404 was replaced by the 405, 406 and eventually the 407. Peugeot launched the ‘Playtime Over’ campaign for the 407 model in 2004, extending it with the Station Wagon. 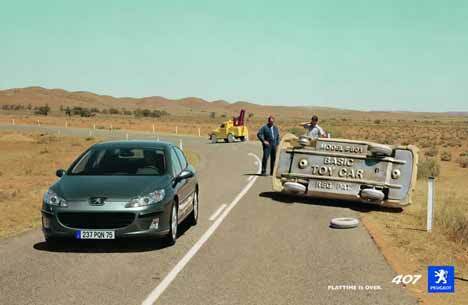 The first ad, known as “The Toys” or “Les Jouets”, features life-size toy cars shown up by the sleek newly released black Peugeot 407. Directed by Philippe Andre for French agency BETC Euro RSCG, the advert was filmed in Sydney, Australia. Andre developed twenty model cars especially for the shoot, resisting the temptation to do the whole thing in CGI. We see cars crossing the Sydney Harbour Bridge. Much of the shot was filmed from inside an actual car, giving that realistic gritty feeling. The soundtrack is provided by French duo, The Film, (Guilliame Briere and Benjamin Lebeau) with their song “Can You Touch Me”, an adaptation of their earlier song, “Can You Trust Me”. 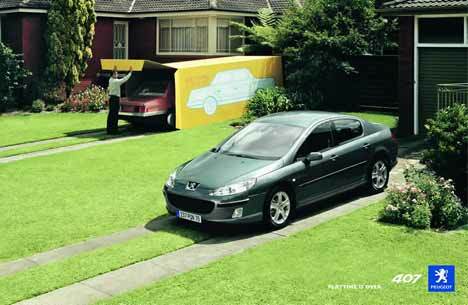 The follow up ad features the same scenario of life-size toy cars in Sydney, this time taking a new Peugeot 407 Stationwagon out of the city to a beachside home. Along the way we see old and decrepit stationwagons breaking down or suffering from image problems. The soundtrack features Caesars track, (I’m gonna) Kick You Out, taken from their album, 39 Minutes of Bliss (in an Otherwise Meaningless World). The Toys campaign was developed at BETC Euro RSCG and Euro RSCG Worldwide by creative director Remi Babinet, art director Eric Holden, copywriter Remi Noel, agency producers Simon Chater-Robinson, David Green and Carole Casolari. Filming was shot by director Philippe Andre via Wanda Productions. The ads won awards at Cannes and Montreux. Andrew Philippe also directed the Peugeot ads, Metamorphosis – Love Me (206) and Reach New Heights (307). The Bridge ad, featuring a feline Peugeot 607 prowling the streets and scaring white mouse-like cars, was directed by Frédéric Planchon. It has overtones of the fear invoked in Ford SportKa Evil Twin.